If you prefer to read a printed page, we have added a customizable Print option so you can print individual articles as needed. Be sure to explore the Printing Plus menu to learn about print options and other site features. Sri Sarada Society Notes Online is a work in progress. We have appreciated your continued support though the years and hope that you will come with us as we embark on this new adventure in discovering the potential of online publishing. We welcome your comments and continuing article submissions. If you currently receive email notices of new issues, you are already on the list! If not, you can subscribe to our MailChimp emailing list using the Subscribe to “Notes” Online form in the sidebar to the right on wide displays or in the widget section below each article on smartphone displays. You can still access individual PDF versions of many past issues here. Or download the complete collection by clicking the cover of the ebook shown below. 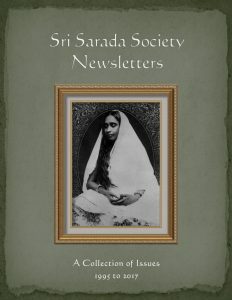 Sri Sarada Society is a nonprofit association of spiritual aspirants interested in the application of the universal ideals of Vedanta with Holy Mother, Sri Sarada Devi, as our inspiration. This site is designed using WordPress.